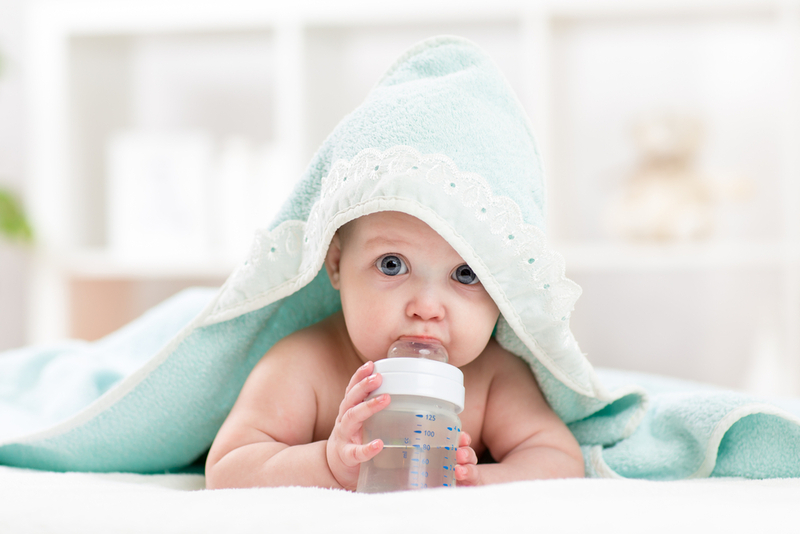 You are at:Start Reading»Baby»Baby Food»Is Alkaline Water Safe For Babies? After the birth of the baby, the parents are always worried about the well-being and the health of the baby. No stone is left unturned to ensure good health of the baby and thus all steps are taken to do the best for the baby. One such important thing is alkaline water so it is important to know its benefits and health associated aspects of alkaline water. Alkaline water is one of the elements that are topping the popularity charts, along with a few crazy diet items and supplements as well. But it is important to know what an alkaline water is, the health hazards of consuming tap water, the health benefits accrued due to consumption of alkaline water its safety for the babies. Let us have a sneak preview of the same and get a better understanding as well. The tap water is never considered safe as it is loaded with thousands of toxic elements. It has been seen in few kinds of research that the tap water comprises of micro-plastics, chlorine, rust sediments, fluoride, bacteria, herbicides, parasites, pharmaceuticals, chemicals, heavy metals etc. with foul odor and tastes. Let us study in brief the effect of these particles on the health of the babies. Chlorine: It has been found that the chlorine water has harmful effects on the infants and children as it could lead to respiratory issues, asthma, skin irritation, increase the risk of having holes in the heart, underdevelopment in the brain, skull etc. Heavy Metals: Heavy metal exposure is extremely harmful to the infants, children, as well as the fetus as the quick development in the children, can be interrupted by the toxins which are found in the heavy metals. It can lead to damages in the nervous system, learning deficiencies, diminishing memory and diseases like ADHD and ADD. It can even lead to damages in the brain. Micro-Plastics: Most of the bottled water available have shown the presence of minute plastic particles yet it is taken by all whether adult or children. It is detrimental for the health of the infants especially as it doubles the quantity of micro-plastic than the tap water and it is the same plastic by which the bottle caps are made. These micro-particles are as tiny as the piece of hair. The water which has more than 7 as a pH level is termed as ionized water or alkaline water. It can be prepared by using a nozzle based ionizer which is a very common method. It is believed that consumption of alkaline water assists with balancing the body’s pH level. Since most of the people have an intake of processed foods, it generates acidic pH in the human body. Consumption of alkaline water helps to counterbalance the acidity and helps to get the acidic pH to the normal one. It helps in reducing the number of diseases associated with bone disintegration, arthritis, osteoporosis etc. As many minerals will vanish from the normal water during the purification process, drinking alkaline water will help to restore the lost minerals like calcium in the drinking water. It minimizes the chances of any forms of kidney ailments especially kidney stones. It boosts the blood flow as can control the pH degree in the body. It helps to boost the immune system of the baby. Alkaline water offers proper hydration than the regular water. It even helps in the protection of the hair and skin from acute dryness. Since it is alkaline, it helps in the prevention of dehydration. Since it is enriched with antioxidants it helps in lowering the threats of premature aging. It assists with obstructing the growth of dangerous bacteria and even helps in protecting from infections. We have read that alkaline water has several health benefits for all. It is yet important to know how safe it is to be given to the babies. We should also know if the alkaline water should be mixed with something or given directly? What is the quantity that should be given, frequency etc? Let us find the answers to these and many more such queries after going through the under mentioned points. Always be sure to consult a doctor prior to offering the alkaline water. Never give alkaline water to the baby under six month. Never give alkaline water to a baby 30-50 minutes prior and after meals. This is important to ensure proper digestion. It is not advisable to give alkaline water mixed with the formula milk or any other type of baby food and best to use filtered water. In case the baby is on medicines, never offer alkaline water with that. In case the baby is having stomach acidity issues, never try to give him alkaline water before asking your child’s doctor. Can I Boil Alkaline Water? Yes, you can. The alkaline water will retain its alkalinity even after boiling. The positive ions may be reduced while boiling, though. However, its benefits will not be affected significantly even after boiling. How Much Alkaline Water Can Be Given To Children? To babies from six to twelve months, one or two ounces of alkaline water is considered to be safe (it is better to ask your pediatrician about this). However, toddlers can drink one to two cups of alkaline water per day. For toddlers, you can even dilute fresh fruit juice with alkaline water. Thus, it is important to gather adequate knowledge with respect to the alkaline water in order to not face any issues and even seek medical consultation and ensure proper safety of the child.